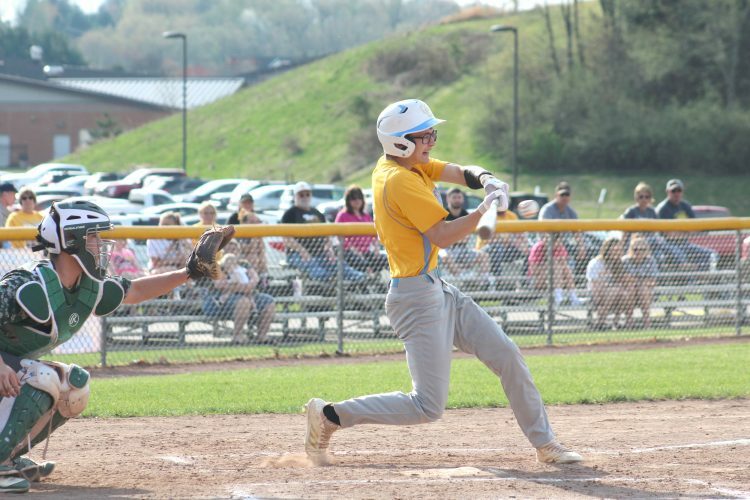 WEIRTON, W.Va. — Due to a conflict with the Weir High baseball team’s schedule, Oak Glen and Madonna faced off on Monday rather than Wednesday. The Golden Bears weren’t complaining, leaving Ed Bowman Field with huge smiles and a ton of confidence. Garrett Brewer was dominant on the mound, and everybody in the lineup contributed during Oak Glen’s 13-2, five-inning victory in its season opener. The Golden Bears scored at least one run in every inning, beginning with Jon Creese’s two-run single in the first inning. Brewer drove home a run in the second when he was hit by a Jake McKay pitch with the bases loaded. In the third, an RBI triple from Hunter Patterson followed by an run-scoring single by Michael Lemley put Oak Glen ahead, 5-0, heading into the bottom of third. For the most part, the Golden Bears were patient during the first three innings, drawing six walks and loading the bases multiple times. Then, they became more aggressive, en route to a five-run fourth inning and a three-run fifth. McKay only recorded one out in the top of the fourth before being replaced by Matt Amaismeier. In the frame, Evan Geisse hit a sacrifice fly with the bases loaded and nobody out. Zach Taylor followed with an RBI double and helped set up a two-run single from Patterson. The final run came when Blake Almo scored on a fielding error, the only unearned run of the contest. In the fifth inning, Jackson Chaney drilled a pinch-hit two-run double on the first pitch. Taylor then delivered with an RBI single. All three runs came off of reliever Dom Mazur. Madonna scored a run each in the third and fourth innings. Dom Brncic hit an RBI single in the third inning, while Amaismeier did the same in the fourth. Brewer left little doubt of a comeback on the mound, picking up the victory in four innings pitched. He allowed two runs on five hits, two walks and struck out seven. Without a radar gun available, Miller believes his fastball reached around 82 miles per hour. Josh Cline closed the game with a two-strikeout fifth. He hit Gavin Dietrich and Luke Beatty reached on a fielding error, but Dietrich was thrown out at home plate for the final out. 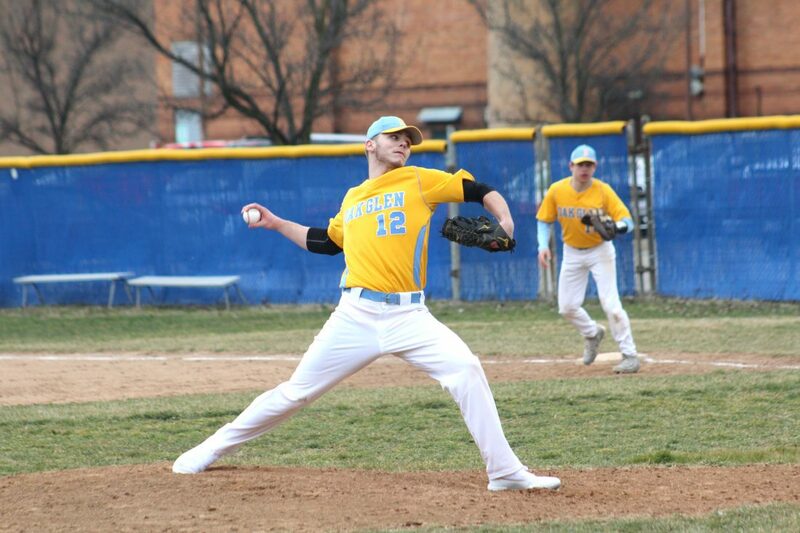 The Blue Dons fell for the second time at home this season, both ending in five frames due to the mercy rule. They lost to Linsly, 19-2, on Friday. Provenzano chalks it up to inexperience. Taylor led Oak Glen’s offense with two singles, a double and a pair of runs batted in. Patterson had three RBIs, a single, triple and drew a walk. Lemley tallied two singles, an RBI, drew a walk and stole a base. All but one of Oak Glen’s 10 batters reached base. For Madonna, all five hits were singles and it drew two walks. The Blue Dons will look for their first victory today at Wheeling Central. Oak Glen, meanwhile, will play at home for the first time on Saturday, welcoming Grafton for a doubleheader. “I can’t stress enough how proud I am of this team,” Miller said. “Garrett and Josh got it done (on the mound). We fielded well and took care of business. OAK GLEN (1-0): Brewer (WP, 4IP, 2R, 5H, 7K, 2BB), Cline (1IP, 0R, 0H, 0BB, 2K) and Kerr. MADONNA (0-2): McKay (LP, 3 1/3IP, 10R (9ER), 10H, 6BB, 0K), Amaismeier (2/3IP, 0R, 1H, 0BB, 0K), Mazur (1IP, 3R, 3H, 1BB, 1K) and Beatty.